John Drengenberg, consumer safety director for Underwriters Laboratories (UL), an independent global safety organization, recently took time out from his busy schedule to speak with LoveToKnow regarding backyard safety concerns. UL is urging families to make backyard safety a priority this season and recommends parents and caretakers establish a "Safety First" attitude to help keep their children safe. LoveToKnow (LTK): Can you tell LoveToKnow what parents and caretakers can do to develop a 'Safety First" attitude? John Dregenberg (JD): It's up to adults, particularly parents, to commit a minute to safety. By thinking just a few minutes about safety you may be able to spot a potential hazard and prevent an accident. You know you can't count the accidents that you've prevented, only the ones that have happened. That's our goal: to alert people to the possible hazards that could be in their backyard. Everyone is busy and excited about summer. They are in a hurry to get out and enjoy their backyards. Kids are out of school. They've grown a little bit bigger and some may be more aggressive. They have friends over for barbeques and pool parties. By developing a "Safety First" attitude parents commit the time to make sure their backyard is safe. LTK: Are there specific areas that parents should focus on? JD: Yes, the three main areas are grills, pools and backyard playsets. About 2.3 million kids go to the emergency room every year because of various injuries and a lot of them are related to those three things. 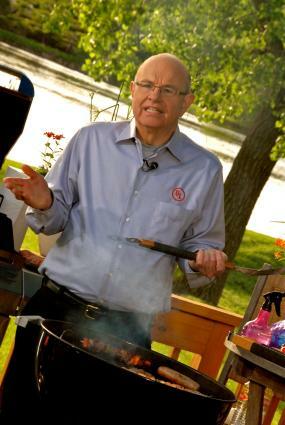 LTK: What can parents do to make sure everyone stays safe when they are grilling? JD: According to the National Fire Protection Association there are approximately 7,900 grill fires every year. Always grill outdoors and keep it a safe distance from the house, garage, carport or any other structure. Keep the grill out in the open as best as possible. Never bring any grill, even a small hibachi, into the house to use. Some people set a small hibachi in the kitchen sink and before they know it the kitchen curtains are on fire. Flare-ups are common in grills when fat drips into the grill. Always keep a little bottle of water to spray on the flames if that happens. It will not ruin your dinner. Charcoal can heat up to about 1,000 degrees. Sadly what people do is dump the charcoal in the corner of the yard or in the sand on the beach. Children are natural explorers and the emergency rooms see many children with burns on their feet because they run on the hot dirt or sand. Always put out the coals with your garden hose or a pail of water. If you are using a gas grill, check the burners to make sure they are clear of dirt, leaves, spiders or other debris. Make sure the connections are tight and the hose is not old and cracked. Keep your extra propane tank away from the grill. If there is a fire, you don't want another source of fuel right there. Store the extra tank in a cool place never in direct sunlight or the trunk of a car. Always put the grill on a level flat surface so it does not tip easily. Keep an eye on the grill and caution children to stay away from it. LTK: What advice do you have for parents regarding pool safety? JD: The number one tip is that adult supervision is necessary anytime a child is in the pool whether it is in ground, above ground or a toddler's wading pool. Every year more than 200 children drown in pools and every one of them is preventable. There is something called the 10/20 rule that is used by all safety organizations. The 10/20 rule basically says that you have to be able to scan the pool every 10 seconds and be within 20 seconds from the pool to lend assistance when it is needed. If a child is missing anywhere in the neighborhood check the pool first. Don't look in the house or the garage. It's a fact that the sooner you get the child out of the pool, the sooner they get help and some oxygen, the better chance they have of surviving. Most municipalities have a ruling about a fence around the pool usually about four feet high with a self-closing and self-latching gate. Even if that rule is not in your community, it is a real good idea to do. It's a barrier and keeps little kids out. Always take all toys out of the pool when you are finished with the pool. The toys are fun and colorful and attract children back to the pool. Dump the water out of little wading pools and turn them upside down in case it rains. Sadly, a toddler can drown in one inch of water. Little water wings and swim rings are toys. They are not safety or personal floatation devices. If there is a pool in the area all adults should know CPR. LTK: What safety tips would you give parents regarding playsets? JD: Parents should inspect playsets at least once a week if kids are playing on them frequently. Look for loose or protruding screws or bolts and make any needed repairs. Many of these playsets have S hooks. Make sure they are completely closed. The recommendation is to squeeze them closed so you can't fit a dime through the opening. The reason is that kids clothing can get snagged and it is a strangulation hazard. Locate the playset away from trees, stumps, rocks and low overhanging branches. Always cover the ground around the playset with the cushioning recommended by the manufacturer. Some people use rubber pellets, others use mulch. Depending on the playset you need to meet certain dimensions. For instance, you might need the cushioning three feet out from the playset if there are swings or six inches deep if the playset is a certain height. For additional information visit Underwriters Laboratories Online Library.